Are you a diehard fashionista shopping on a bargainista budget? Then 9thandElm.com is the daily deal site for you! 9thandElm.com was founded by Clay and Elly Bethune in the spring of 2013 with a mission to bring it's members fabulous fashion from the best handmade and independent designers. We realize it is extremely difficult to sort through and discover handmade fashion geared towards the "fashionista". Search no longer. Exclusive deals handpicked by our buyers will be delivered daily to our users inbox. This site is a multiple designer site. I was invited to shop at 9thandElm.com and share my experience with you. I warn you that browsing 9thandElm.com is seriously addictive. I am glad that everything is discounted! 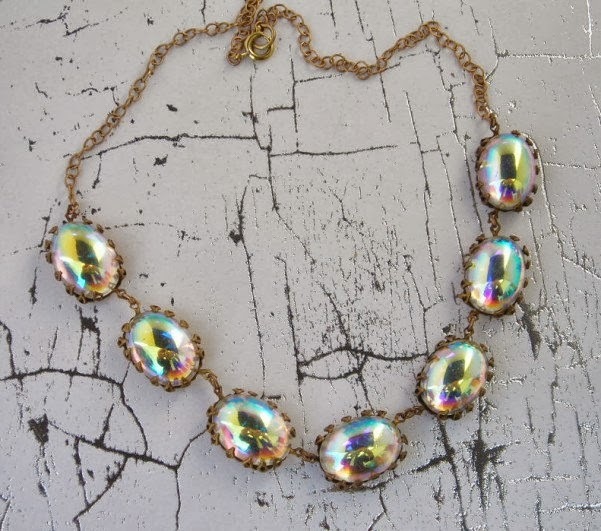 I ordered this Aurora Borealis Peacock Necklace for $44 (a $5 savings off the original price). It is made of beautiful vintage glass rhinestones set in vintage brass crown settings by designer Lilis Gems. The oval shaped vintage glass cabochons change color depending on how the light hits. I wear this at least once a week and all my co-workers want one! 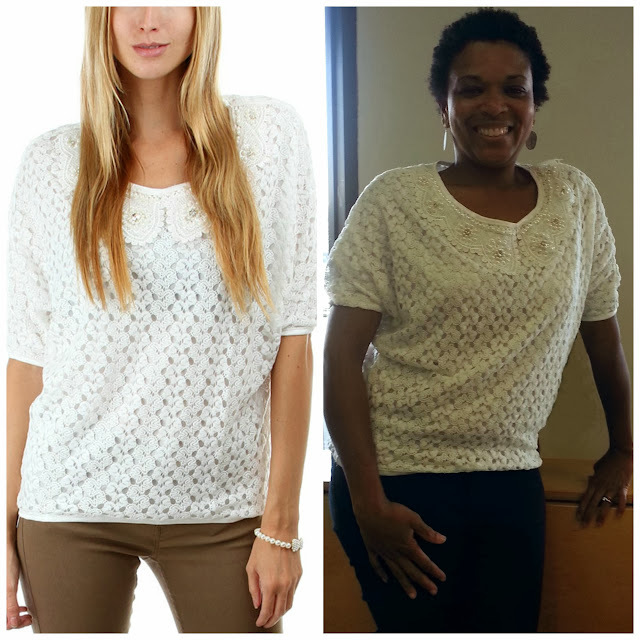 My next purchase was this Crochet Dolman Sleeve Pearl Collar Blouse for $26 ($8 savings off the original price). It is a stunning that feels more like an piece of art than clothing. It is also versatile. I wore it with jeans, but I can see myself wearing this with a long chiffon skirt to Christmas dinner since the fashion police has declared it okay to wear white after Labor Day! My items arrived super fast because orders ship directly from the vendors. I was happy the process from order to arrival. I cannot wait to shop again! I better get started on referring some friends so I can earn $25 credit for every referral who makes a first time purchase. I am going to get you hooked too! Here's your chance to win a shopping spree to 9thandElm.com! Event Prize: 3 Winners $400 Total Value! (1) $200 Gift certificate and (2) $100 Gift Certificates. US AND CANADA ONLY. Cute necklace and that top is so pretty! I love that top so much. I have seen it on several other people but your idea of wearing it with a chiffon skirt just makes me want it even more! Love 9thandelm.com! What wonderful choices you made. I love how 9thandelm.com has something for everyone. Very pretty - both will be great for parties or for everyday. Can't go wrong with choices like that. I like the top. It not only looks really comfy, but can be worn with so many outfits. the necklace is very pretty and unique. Looks vintage and the top is gorgeous. I absolutely adore that necklace you got! Wow it is stunning! Loving the shirt and that necklace is great! Very pretty top! Love the lacy look. I love that blouse! It looks so great on you! I like unique items so I really like the 20 gauge flowers necklace! I have that shirt and LOVE it. That necklace you chose is incredible! Love the Aurora Borealis Peacock Necklace! It's like multi colored shells and so colorful! The top looks great on you and yes, 9thandElm.com is seriously addictive! You look great! Love both items that you chose! Oh! That necklace looks so glamorous! And I love that top on you! I really love that top, and the necklace pops! I can think of lots of outfits that would go with. I really like the LovMely collection, especially the Gold Chain Foot Anklet! It is so pretty and I love feeling like I am somewhere tropical so that jewelry would be perfect! You're so right about the site being addicting! I keep browsing. It's fun!! That white top looks really good on you. I'm loving those Mint Solid Basic Leggings Seamless With Faux Seams Trim! I like thin leggings, and they also appear to have a nice waistband. All their leggings look nice!